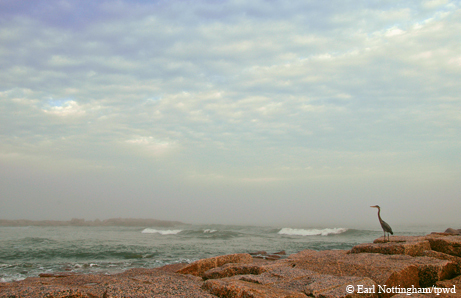 Water is something to celebrate as it flows through Texas' national and state parks. 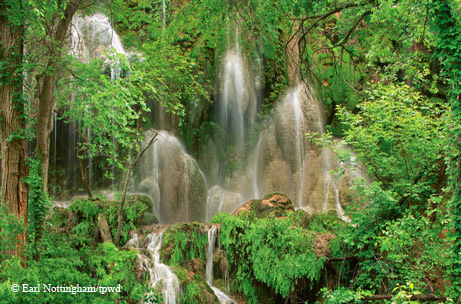 Waters born from above and below, from desert downpours to crystalline springs, carve their way across the vast Texas map, shaped and colored by their geography and geology. They gradually unite and mix as tributaries become creeks, creeks become rivers and rivers become gulf. Along their transformative journeys, many will flow through tranquil places, away from the noise and trappings of civilization, each bringing beauty to the landscape and inspiring those who seek its restorative power. Colorado Bend State Park: Spring-fed waters from Gorman Creek cascade 60 feet down multiple tiers of fern-covered travertine slopes to form Gorman Falls. 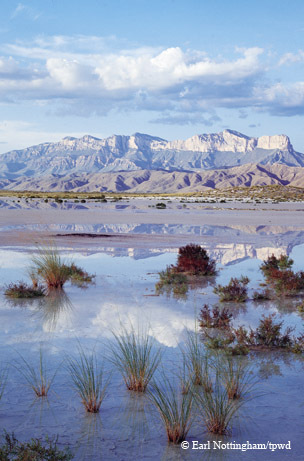 Guadalupe Mountains National Park: Shallow-water salt flats and gypsum flats are all that remain of an ancient lake, once fed by surrounding streams and by the runoff from the Guadalupe Mountains. 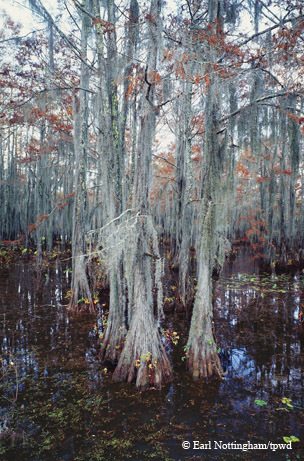 Caddo Lake State Park: Thick bald cypress trees and lush vegetation in tannin-colored water create a maze in the sloughs, bayous and ponds of Caddo Lake. Big Bend National Park: Hot springs overflow from the foundation of the bathhouse built by J.O. Langford around 1909. 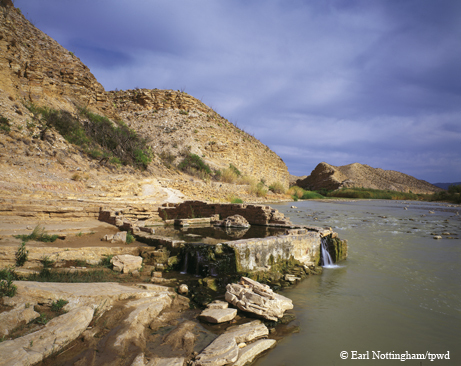 Today, visitors still soak in the clear 105-degree springs as the Rio Grande rushes by. 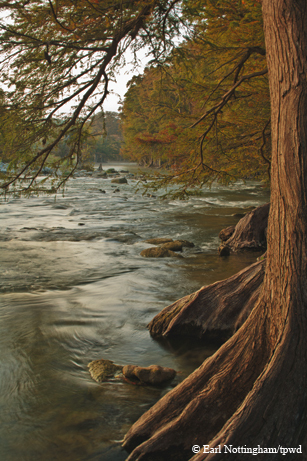 Guadalupe River State Park: Framed by bald cypress trees, the Guadalupe River winds through the park in a series of deep pools and shallow rapids. 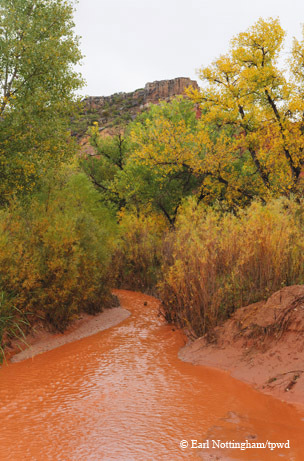 Palo Duro Canyon State Park: A red tributary of silted claystone and sandstone flows after a rainstorm on its path to the Red River. Mustang Island State Park: Tides flow through the jetties of Mustang Island, merging waters of Corpus Christi Bay with the Gulf of Mexico.